Diecast; including early pre and post war models, Farm vehicles & implements, Motorcycles, Accident & Emergency, Military, Construction and Space vehicles. Plastic figures; including Herald (UK & Kong Kong), Eyes Right, Swoppets, Zoo Series, Farm Series, Make-Up Trees, Floral Garden & Mini-Sets together with items from the general Britains range. Metal figures spanning 1890-1990 including; pre and post war Military sets, Civilian ranges including Farm, Zoo, Wild West, Circus, Hunting, Football, Boy Scouts, the 9000 series & Metal Models. Selected modern issues produced by W. Britain Ltd.
Our books are mailed on Mondays & Thursdays every week following receipt of payment. 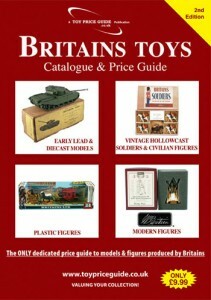 The Toy Price Guide is a dedicated publishing company providing current market values for classic and vintage toys. Each of our books contains approximately 200 colour pictures together with a comprehensive listing, including variations, of each of the models produced by some of the UK’s much loved classic toy companies.